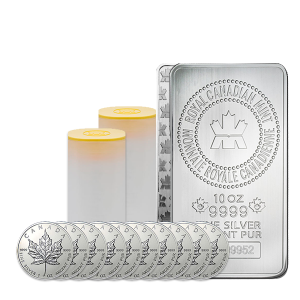 Contains: 1 x 10 oz RCM bar; 2 x 1 oz bars ; 10 x 1 oz Maple Coins. Silver Combos are a very popular product at Guildhall. New silver investors can often find it confusing to know what type of silver product to buy when there is such a variety of coins and bars available. 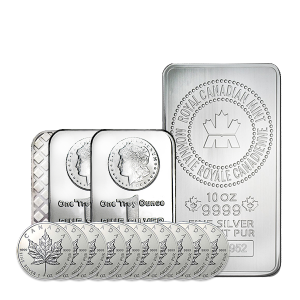 Which silver bars, silver coins and what sizes are best? Silver Combos take the guesswork out of choosing amongst the endless variety of bullion available. The Combos are tailored for all investors who wish to hold a variety of silver products and sizes. 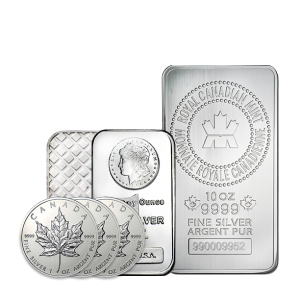 Silver investors who are new to the market particularly enjoy Combos because they provide an easy way to acquire various silver bullion products in the most cost effective manner. Each silver combo available at Guildhall Precious Metals contains an assortment of coins and bars of various weights. Enjoy the convenience of ready-made silver portfolios containing the finest physical silver available. 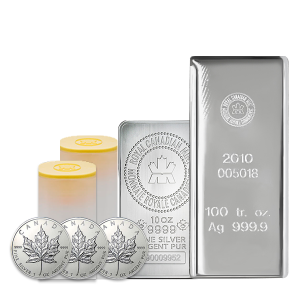 By buying a silver combo, clients receive product variety, value and convenience. Contact a Guildhall representative today for more information on our services.